Martin Storey KAL 2016: No Sew Garter Trim! This is the second Martin Storey blanket (or afghan if you prefer) KAL I have knitted and I must admit I quite enjoyed this one. 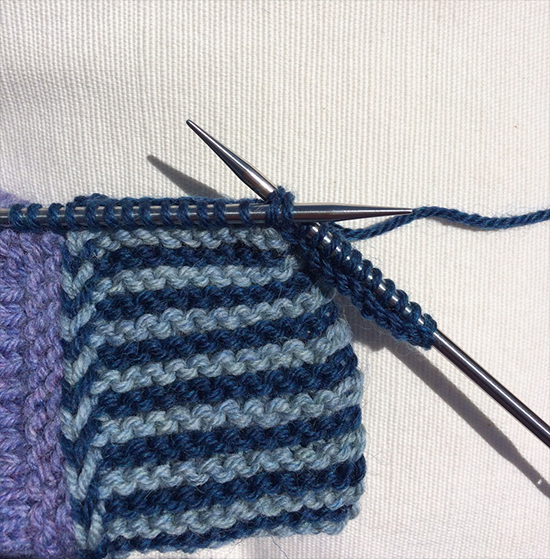 It could be because I chose to knit it up in my favourite colour, these lovely shades of blue……….. 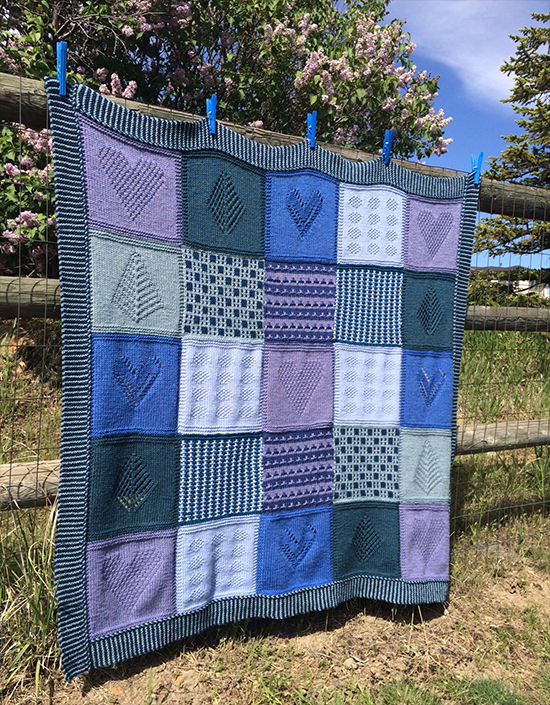 The blanket is knitted in Rowan Pure Wool Worsted, a beautiful 100% super wash wool which comes in 60 different shades plus 8 variegated shades. 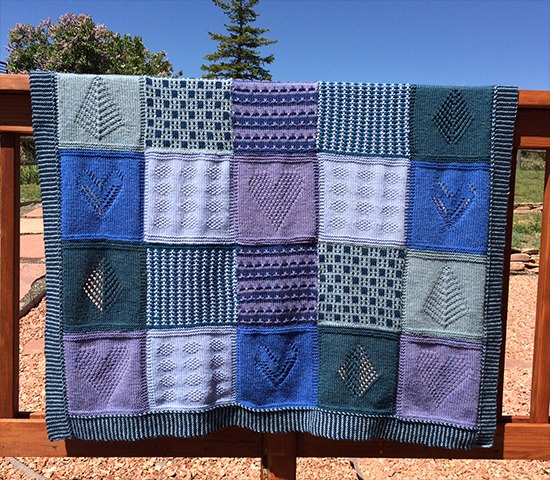 The KAL pattern comes in 4 different colourways that Martin Storey has chosen for but with so many shades you can choose your own if you so wish. From the start I decided that I was only going to knit 25 squares in total rather than 48. I didn’t need another large blanket and thought one just big enough to cover my lap and legs was ample. The finished size of mine is 120cm x 120 cm (47″ x 47″) which works just great. The other issue was all that sewing up……. I just couldn’t face it again. And then there was the garter trim to knit and sew on…..more sewing! With that in mind I was determined to work out a way to knit a no-sew garter stitch trim rather than sew it on afterwards. So, here’s what I came up with……. 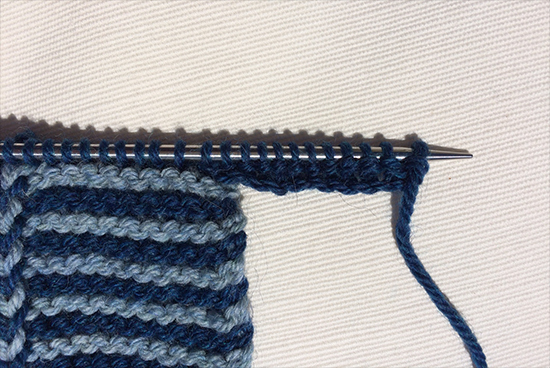 Continue to pick-up and knit stitches until you reach the left hand corner. For the length of my long tail from the ball of yarn, I measured out a length of yarn that was 3 times the length of my 5 squares and started to pick up and knit the stitches from here. My blanket is 5 squares by 5 squares in size. Make sure you pick up and knit with the long tail of the yarn and not the yarn from the ball. 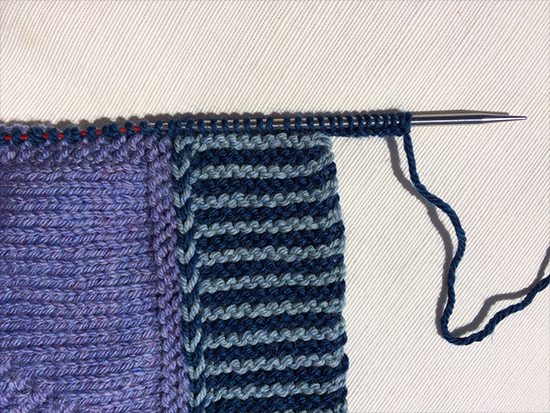 When you reach the left hand corner, go back to the right hand corner and cast on 12 stitches using the knit cast on method and the yarn from the ball. Martin Storey’s pattern states to cast on 13 stitches for the garter trim but as you will not need 1 stitch to sew to the main blanket I decided to cast on 12………. Next row: Turn the work. Slip the first stitch purl wise and then knit to the end. 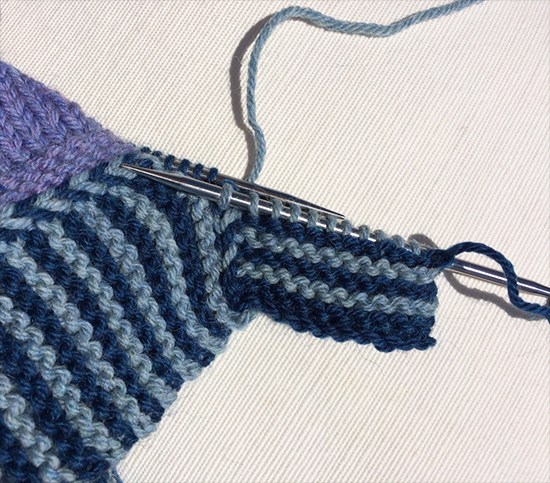 Join in yarn B and repeat from * changing yarn shade every 2 rows. When working with two different shades of yarn don’t cut the yarn when changing from one shade to the other but bring the yarn you have finished working with to the front of the knitting and the yarn you are about to work with towards the back. This will ensure you produce a lovely neat edge. (For a link to a more detailed description see below). 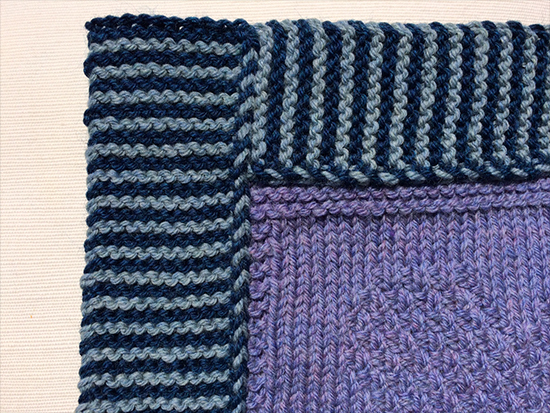 You will see that it is slightly different to the patterns garter stitch trim with a raised stitch nearest the blanket squares however, I like it and I am more than happy with this no-sew knitted on trim. And, when you have finished knitting the trim you are almost done; just a few ends to sew in. 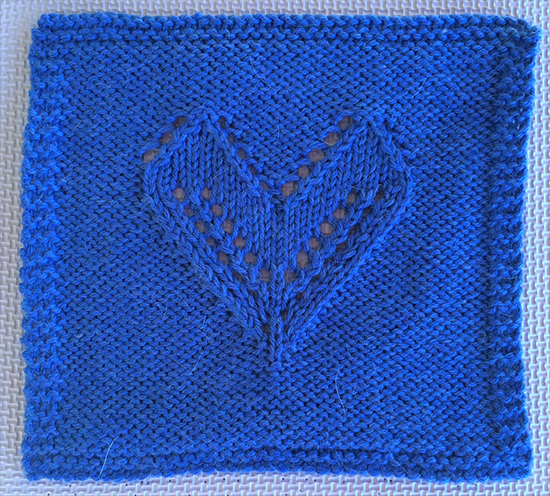 Yippee……………..
Another change I made was to the Lace Heart square. 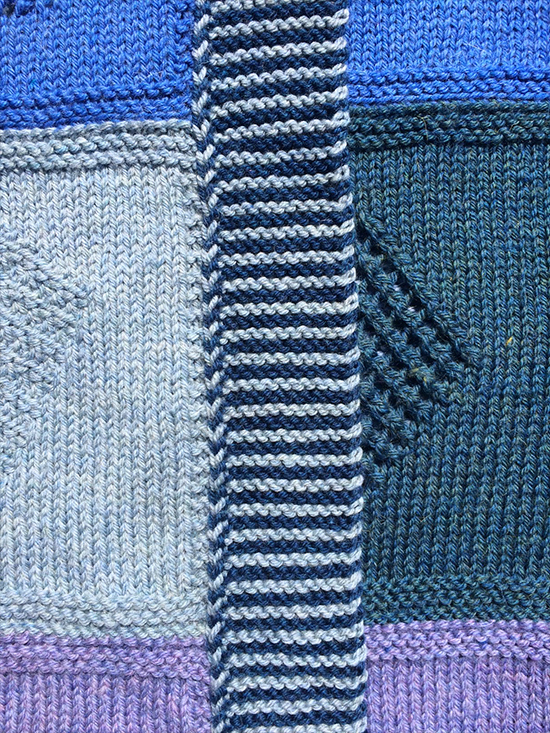 I was quite happy with it as I was knitting it up but then when I laid it next to the other squares I didn’t like it; it looked like it was the wrong way up compared to the other squares……….. 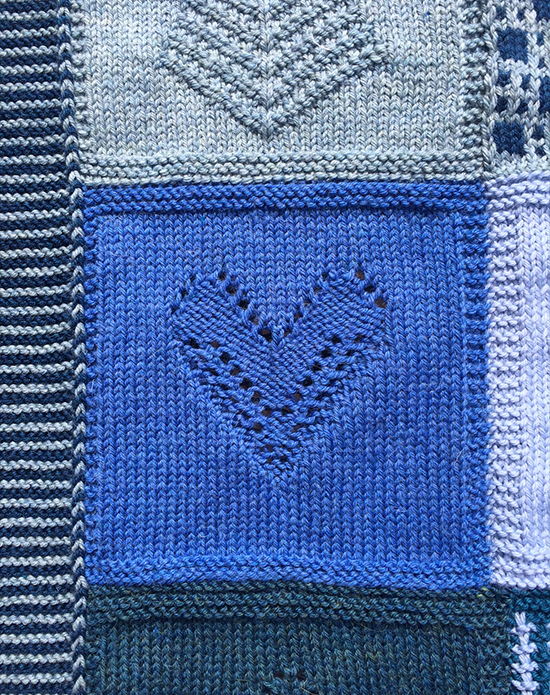 So, I decided to turn it over with the background of the square in stocking stitch and the heart side in reverse stocking stitch. 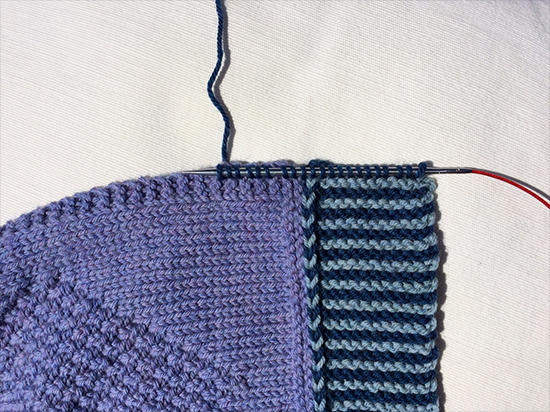 As I knitted less squares I had to design my own layout which I did as I went along. I like symmetry, as you can see…………. So, there it is ………my version of Martin Storey’s KAL 2016. I hope Mr Storey is not too upset that I messed around with his design so much? Of course, you can knit the pattern exactly as it is and the way Martin Storey intended it to be. If you would like to join in with this KAL click on the link below for all the relevant information including links to all the patterns, Ravelry, You Tube videos, tutorials, etc. Don’t forget to login otherwise you won’t be able to download all the free patterns. 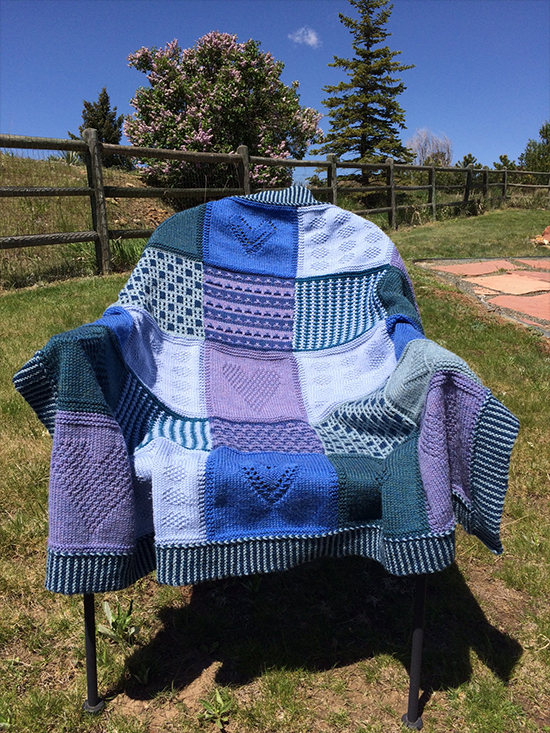 And, my previous post on this KAL, which also includes instructions for changing and carrying up yarn at the edge of work, click on the link below….. If you are already taking part let me know how you are getting on by leaving a comment below, I would love to know! Thank so much for reading my blog.